The best time to visit Costa Rica is January after the holiday peak season tourist crowds head home. The rains end in December but the forests remain lush into the new year while dry sunny weather prevails on the beaches. It’s one of the best times for wildlife when tropical species like monkeys and sloths are joined by migrant birds from the north, humpback whales giving birth in the warm waters, and sea turtles nesting on shore. Another excellent answer to the question “when is the best time to go to Costa Rica?” would be July and August when there’s a bit more rain but even fewer visitors and lower prices. In fact there’s no bad time to go. It really depends on what your travel goals and priorities are. 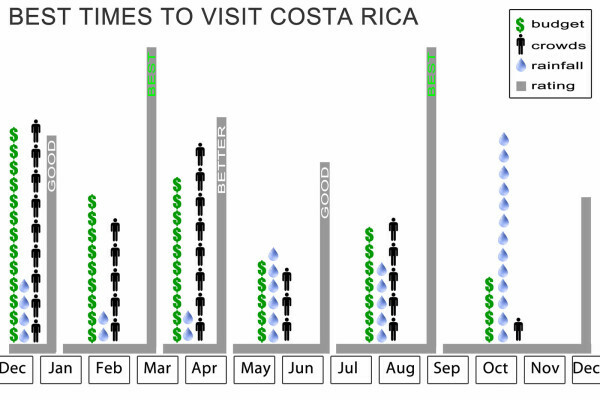 This graph shows relative costs, amount of rainfall and size of the crowds to help determine when to take your vacation. The best weather depends on where as well as when. 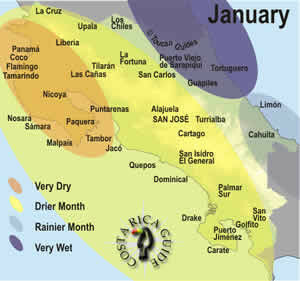 There are a number of distinct microclimates in Costa Rica and it can be flooding in one zone but bone dry in another. We’ve visited at every time of year and while there are advantages to the high dry season (see suggested itineraries) we often prefer the low rainy season (referred to by the tourism board as the “Green Season”). As you can see by comparing the weather maps there are a few places where it would be ill advised to visit at specific times because of the weather (the Osa/Southern Pacific in October for example) and some undiscovered and uncrowded times with gorgeous weather (the Caribbean in October). Other comparisons and suggested alternatives are noted in the summary of each month linked in the drop down menu. Don’t forget while browsing all the weather and climate data that one of the reasons you’re visiting Costa Rica is because it’s covered in amazing rain forests, and surprise, surprise – it rains in the rainforest. If you’re only looking for sunny days on the playa then Costa Rica has a zone and season that guarantees that too – January, February and March are bone dry in Guanacaste (the northwest beach area). Crowds, Costs and Other Factors? There used to be distinct high and low travel seasons in Costa Rica but the secret is out. July and August are as popular as December. Discounts have shrunk or even disappeared. There are still cost differences depending on dates. For example, Christmas and Easter peak weeks are nearly twice as expensive as the average and the shoulder months (May/June and Sept./Oct./Nov.) are uncrowded with price breaks available. If you’re going to travel over Christmas or Easter you should book about a year in advance for the best selection and some places are filled even further in advance. Shifting your travel by a few days away from the holidays can make a huge difference. If there are other factors you’re wondering about let us know and we’ll do our best to help figure out the best time to go. NOAA and other agencies are predicting a good chance of an El Niño Weather pattern building in October and November of 2019 and continuing into 2019. 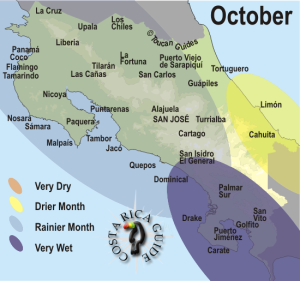 Typically El Niño decreases rains on the Pacific side and makes the Caribbean a bit wetter. Something to keep in mind when looking at the rainfall maps. Ash from intermittent eruptions of Turrialba volcano have occasionally disrupted operations at San Jose (SJO) airport since 2015 into mid 2018 and are expected to continue sporadically – see Choosing an Airport for more info. Use these quick descriptions to get the big picture of good, better and best then click on any month for details. You may also want to try the best time quiz to determine when you should visit. This dropdown menu links to our suggestions for other “bests” in Costa Rica – places, wildlife watching, activities, secrets and more.